Hello Everyone and Welcome at the Outlawz We have a New Theme for our Festive Fridays Challenge. Our Design Team has put together some awesome projects to inspire you for this weeks Challenge. I hope you get the time to check them out and join us. I decided to make my card about a Fairy Tale. 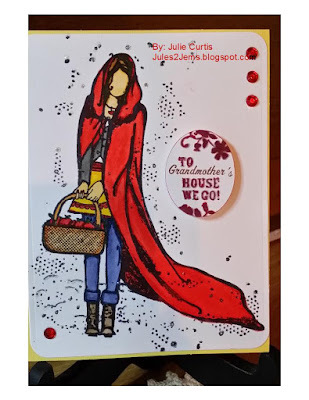 I found a Stamp awhile back and this gave me the perfect opportunity to buy the stamp and use it on this card....Like I really needed a reason to buy the stamp..Haha I hope this inspires you to make a project and enter it into the Challenge. We have Soooo much fun with this Challenge and all the crazy National Days we Celebrate. It is a lot of fun! The stamp is from Unity Stamp Company. Isn't she beautiful!?! Her name is Red Girl and you can find her by clicking on her name. I water colored the image and used Diamond Stickles on the snow randomly around the image. The sentiment was from my stash and really tells what the theme for Tell a Fairy Tale Day. I added Jems to the card for a little bit more detail and color. I didn't added a lot of embellishments because I really want the image to be the focus on this card.